In 2003, the Faculty of Health & Behavioural Sciences at our university offered a series of postgraduate research seminars. The series of seminars, selected by a three-person faculty team, received a mixed reaction - some seminars attracted a large proportion of the students whereas others were poorly attended. Thus, it was decided to continue the seminar series in 2004, but to undertake some formative evaluation to determine the students' preferences for the seminar topics. It was important to gain input from as many students as possible, and to allow maximum latitude for responses. 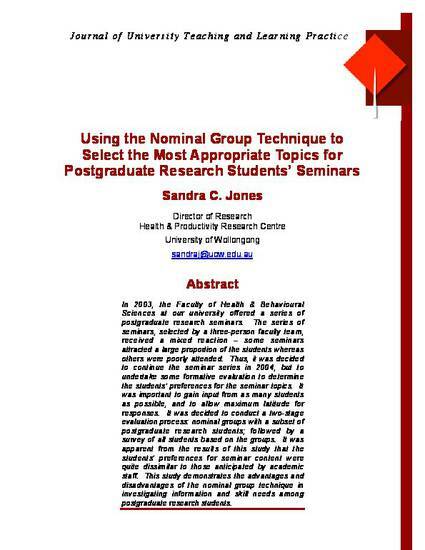 It was decided to conduct a two-stage evaluation process: nominal groups with a subset of postgraduate research students; followed by a survey of all students based on the groups. It was apparent from the results of this study that the students' preferences for seminar content were quite dissimilar to those anticipated by academic staff. This study demonstrates the advantages and disadvantages of the nominal group technique in investigating information and skill needs among postgraduate research students.